Presenting in the Hartley/Vey Studio Theatre on Friday Oct. 25, 1:30 p.m.
Nobody ever has enough microphones. But Audio-Technica guru Steve Savanyu isn’t here to sell you more mics. He’s here to show you how to intelligently use the ones you already have—which microphones to pick for various live and recording applications, and equally importantly, where to place them. 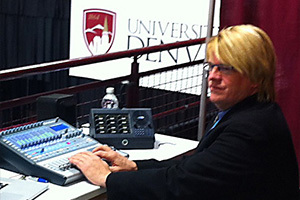 An accomplished presenter and teacher, Steve has over 35 years of professional audio production experience in live sound, contracting, studio, and broadcast applications. Steve is recognized as an InfoComm Academy adjunct faculty member and teaches audio-production crses at Kent State University in Kent, Ohio. He’s also the Director of Educational Services at Audio-Technica, and all-around supreme guy. “My favorite fun memory was last year during the Saturday night event when John Mills was doing a live mixing demonstration in the Manship Theater. Rick and other execs were live on stage. There was a POV (point of view) camera facing down on the StudioLive 24.4.2 console projecting the console surface image on two large screens at the stage. This way the audience could see what John was doing with the console. Someone made the comment about John’s hands on the console (That was all you could see.) I stood behind John and reached in every so often so there was a third and fourth hand on the screen. The hands would smack each other and poke at each other. The crowd roared and we were laughing out loud. #TeamPreSonus Spotlight: Steve Savanyu! Hedgehogs, Presidents, and Popes… Oh, my. Who are you, where are you, and what do you do? Steve Savanyu. Hudson Ohio, I am the educational services director at Audio-Technica and teach at Kent State University. I teach microphone and wireless workshops at universities around the country and have taught at all of the PreSounSphere events… In my spare time I operate Buford T. Hedgehog Productions, a local production company that does live sound, studio recording , live remote recording, video production and lights just for giggles. I also participate in really big events such as Presidential Debates, Papal visits, and Inaugurations…. How were you introduced to PreSonus? Through a friendship with Rick Naqvi, at a church sound seminar where I was teaching a microphone class. I assisted with a live recording at the event where we used 3 FirePods aggregated together on my Mac laptop. It was a fun experience and we learned a lot. 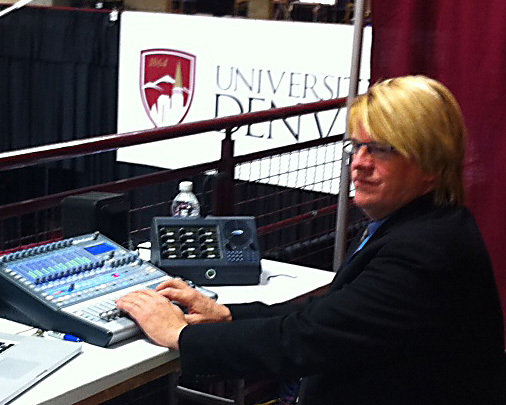 Ask Rick about hot patching into a non-transformer isolated 48-channel stage snake splitter. It made a big noise on a really expensive NEXO line array…. Oops. What PreSonus software/hardware do you use and for what purpose? Where shall I begin? I currently own 5 StudioLive 16.4.2’s, one StudioLive 24.4.2, and 1 StudioLive 16.0.2 which I use primarily for live gigs. I also have been known to carry the 16.0.2 out as the front end for remote tracking sessions using Capture. (I have recorded the orchestral score for two Kent State Student films this way). My original location rig is a FireStudio with 2 Digimax Pres to give me 24 inputs. (I multitracked a basketball game with it for an Audio Technica project. We were showing how different mics and positions affected game sound for broadcast.) In the studio I have a Central Station with remote for speaker management, and a FaderPort which I use as a controller for the audio part of my video edit rig. I picked up an AudioBox 44VSL for location video work (tied into a MacBook Pro laptop). I run a legacy Pro Tools rig in the studio with a DIGI-003 interface (back when ProTools required Digi hardware) with DigiMax D8 mic pre. The band I work with uses two of the 16.4.2s and performs about four nights a week on average (in different locations). The ease of operation on the StudioLive console and the ability to save scenes makes it a snap for the band to use. On the software side, I use Capture to record almost every live event we do. The low overhead of capture allows me to use some pretty basic computers to record up to 32 tracks via two linked StudioLive 16.4.2s. In the studio, I have been using Studio One Professional 2.5 as my main edit software. I like it, as it’s intuitive and has low computer processing overhead so it runs great on a laptop. As an experiment, I mixed a seven-song EP of a band I work with on a flight from LA to New York! I was burning out the CD as the flight attendant was saying power down your electronic devices for landing. Of course my Audio-Technica ATH-M50 headphones made accurate monitoring possible in the plane’s less-than-fancy mixdown environment. What’s so great about PreSonus, anyhow? First and foremost is the people! I have called Justin and Rick on weekends and evenings with questions and they always get back to me promptly. I have participated in both PreSonuSphere events and like the camaraderie of the entire PreSonus Family. Where can our readers learn more about you online? First and foremost, check out the Audio-Technica.com website. A-T makes great studio and live mics that pair up well with PreSonus hardware. Our new AT5040 with its revolutionary capsule design and “pure, simple signal path” would pair up well with the ADL 700 Channel Strip (hint hint, I have the mic…) Our Artist Series and Artist Elite live sound mics are second to none. As for me, check out my website www.bufordthedgehog.com and visit me on Facebook. I try to post a FOH picture of every gig I do either on my page or the PreSonus user group page. I am on LinkedIn but don’t do the Twitter thing. You can see some of my video work on the A-T YouTube channel as well as other audio companies’ YouTube channels. I have several published articles about doing audio for video and I am the audio expert on the FilmSkills online training series produced by Jason Tomuric. I attend all of the major trade shows: NAMM, INFOCOMM, NAB, etc. and do microphone and sound workshops at universities, church conferences (with my good friend Doug Gould) and trade shows. You can’t miss my distinctive look…. just ask for the blonde guy!